I woke up feeling a thousand times better than yesterday, though still not entirely back to normal. Deb and I had our spa day planned so I was out the door before 9am for our 10am massages. The entire spa was underground. Good thing I'm not the claustrophobic type. Navigating our way to the spa was tricky because the hotel was huge, but we eventually found it. And before too long, we were all cozy in our spa robes and enjoying the lavender-filled spa air. The massage therapist told me I was getting a Swedish massage and asked if I wanted light or medium pressure. Medium please. I could have used a bit more pressure even, and at one point asked for as much, but mostly it was good. I wasn't really in the mood to be tortured, though my muscles probably needed it. After the massage we sat down for a cheese plate and a glass of champagne. As you can imagine, I barely touched the champagne. But I enjoyed the cheese, crackers, fruit and nuts. We spent the next couple hours enjoying the jacuzzi, reading magazines and talking about kids, running and life in general. We finally got hungry and had a late lunch at the restaurant. I had a turkey, bacon, avocado sandwich with french fries on the side. Yummy, crispy fries. I didn't finish them though because they weren't as good once they cooled off so I told myself to stop eating them, "you're not enjoying them anymore, you're just eating them because they're there." The good news is I managed to eat most of them before they cooled off. And plenty of water, I was hydrating all day trying to get my body back in balance. I debated with myself about going for a run to make up for yesterday's missed 4-miler. Nope, my body was still tired and I just felt like I needed rest. So I went home and spent some time playing with the kids. I had a plan for dinner but it kind of fell apart so I ended up making chicken-and-rice. I've been getting a lot of questions lately about how I eat so I'm going to try and post more of my meals. This was what I had for dinner. 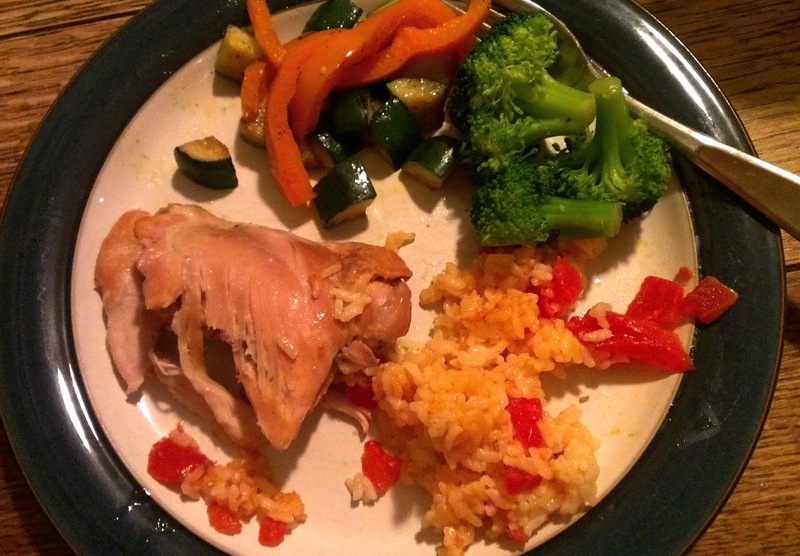 Chicken thigh (cooked w/o skin), rice, zucchini/bell pepper saute, steamed broccoli. I'd eaten some of the chicken, half the rice and some of the veggies before I took the picture but you get the idea. This is a very typical meal for me. I cooked the chicken and rice together, a very easy, quick and versatile meal. You take the skin off the chicken (and I try to remove as much fat as I can) and then brown both sides. I don't put any oil in the pan because before long the chicken provides that. Then remove the chicken, put the cleaned rice in (and any veggies/spices/extras you might want with it), add liquid (I like to use chicken stock), stir, put the chicken back on top, cover and cook until the rice is done (20-30 minutes). So easy. I felt really good after dinner and started itching to get some exercise. Miguel gave me the green light so I changed and headed for the gym at 8pm. I knew I shouldn't try and run the full 4 miles I missed yesterday, and I also figured I should try and take it easy given my tentative recovery. So I did what I call a "lite" workout, less time, less intensity. I ran 2 miles on the treadmill in 18:26, mostly at 6.3mph with two, 2-minute intervals at 7.3mph for good measure. After the run I did legs/shoulders/core for strength training. In total I was there for one hour and felt great when I left. Lite workouts are great for when you are pressed for time or don't feel up to doing your normal routine for whatever reason. People like me can have that all-or-nothing thinking and often forget that something is better than nothing. This is especially true when you are first building regular exercise habits. In the first 6-9 months of establishing your routine it's more about building the habit than anything else anyway. The habit will keep you going over the long haul (as in, the rest of your life) so I like to tell people just starting out, "it's the habit, not the calories." I don't care what you do, just do something. I just had the same conversation with some co-workers about exercising. It is important just to do something even if it is just 10, 20, 30 minutes. Thank you for this post. I'm trying to rebuild my habit. Yesterday evening I SOOO did not want to exercise (partly because of the caffiene addiction withdrawl....lol) I made myself get up and get on the exercise bike. I only went 15 minutes. My husband laughed and said "That's it?" I felt bad about my short round. But your post helped me realize that what I did was the right thing! Thanks! You DID do the right thing. Isn't it so easy to get that all-or-nothing thinking like your husband might have had? Why do only 15 minutes? Because 15 minutes is more than 0 minutes, because 15 minutes lets your body know to expect to move, and reminds you of your goals. Most importantly, it sets the habit to move that body on a regular basis. Great job! I'm glad you're back at it, just do whatever it takes to make it past March. Thank you for the food update! I often struggle with what to make and get in a rut and make the same stuff over and over and then get bored. I always make chicken breast, but thighs are so yummy! I'll have to try it and to cook it WITH the rice like that, brilliant! Thank you! I am on day 3 of my 100 day challenge to lose 16 lbs. :) So far, so good. My body is sore but it feels so good! No problem. Food ruts are easy to fall into. I have a pile of healthy cookbooks that I try and pull on Sundays to meal plan. With the holidays that all fell apart but I'm hoping to get back to it starting this coming Sunday. I like the 100 day challenge idea, 3 months is a huge milestone in forming new habits. Keep it up!! 2012: Year in Review & 2013: Goals!